A perfect and stylish event to greet the New Year in Budapest, in a prestigious historic palace, the Duna Palota. Delicious food of five courses with selected wines, a live gala concert or folklore show, midnight dinner, party with open bar and true ballroom atmosphere make this a memorable program for the last eve of 2019. If you prefer not to have dinner you can book the event with a 90-minute dazzling folk performance plus standing reception with welcome sandwiches and an open bar. dinner at midnight See detailed program below. The concert, starting at 22.00 and presented by one of the most Hungarian famous symphonic orchestras, offers exquisite cultural entertainment. It is a truly spectacular program in the elegant neo-Baroque theatre hall of the Danube Palace. After the fine dinner and concert toast with a glass of champagne at midnight then enjoy a standing reception then dance away the first hours of 2020 to live music performed by a talented DJ. 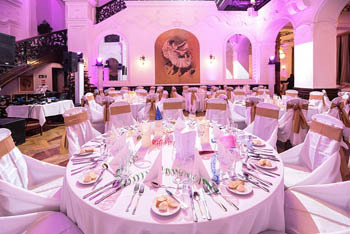 The reception includes open bar with unlimited drink consumption and traditional Hungarian New Year’s dinner. Dress code: please wear suit & tie! TIP: The New Year’s Day Gala Concert on 1st January 2020 also takes place in the Danube Palace. Tickets are available in 3 categories + VIP. There is also a Chamber Concert celebrating the New Year, also in the Danube Palace, starting at 17.00. The palace is Downtown Budapest‘s most prominent theatre and concert venue. The pale-yellow, neo-Baroque building dates back to the second half of the 19. century. It functioned as the cultural centre of the rich and noble. Dvorák who performed in its first class concert hall. The palace has a large theatre hall with comfortable seating area. Here is where the gala concert takes place. The stage can be perfectly seen from all parts of the auditorium. Besides the theatre hall several other meeting rooms of various sizes offer a place for meetings, festive dinner and parties. 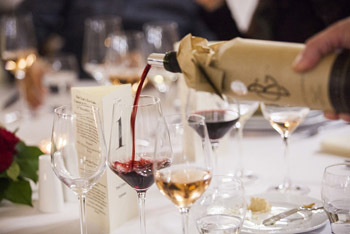 Five courses with wine pairings served at set tables. 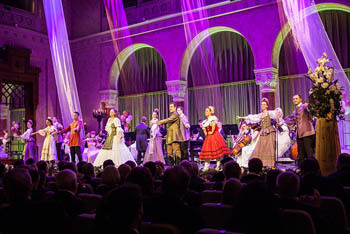 A 90-minute performance of classical music, operetta and ballet pieces and traditional Hungarian folk music. There is a 10-minute intermission between the the two parts. Clink glasses with your family and friends to greet the New Year! Welcome 2020 on our standing reception in the grand ballroom of the Duna Palota! Midnight buffet dinner with drinks! Have a terrific time and dance the night away for tunes of the 90’s provided by a talented local DJ. There will be no empty plate or glass on our all-inclusive standing reception. A 90-minute dazzling performance featuring authentic Hungarian dances and music. Laposa Rizling: Badacsony Hill/Lake Balaton: Rhine riesling on volcanic soil. Fruity and slightly mineral with complex aroma, white fruits, vivid, long finish. Konyári Rose: South Balaton: bursting with fruits: peach, red currant and raspberry aromas. Juicy and full of flavours with the spiciness added by Cabernet Franc and Syrah. Heimann Kékfrankos from Szekszárd region: medium body with notes of cherry, red berries and spices. Everything that’s necessary for a great party! Scroll down for Vegetarian Menu! Traditional lentils pottage with crispy roasted pork.